Question 1: What should I do when they say I’m overqualified? When a company is assessing whether or not you are a fit for them, what they’re really saying is are you a mini version of the company? Does your performance match our performance? Do your values align with our values? Does your background resemble our background? Do your strengths support our strengths? As stated in Part 1, you have 4 identities in the world. 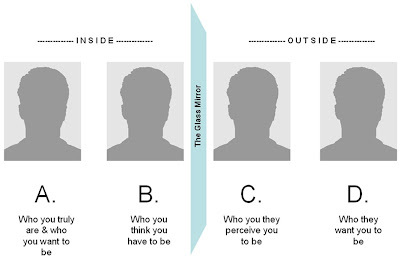 There is a a 99% chance that you will get hired if you are able to wipe the glass mirror clean and show the potential employer that who you truly are and who you truly want to be are in perfect alignment with who they want you to be. I call this perfect employment; it’s a state of being where work doesn’t feel like work. 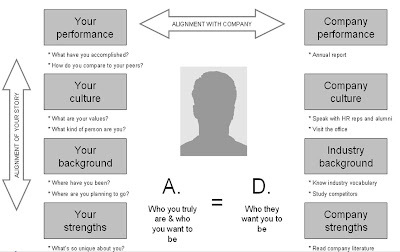 During your inner-view, your focus should be on 1. the alignment of your own story which includes your strengths, background, values/culture, and performance, and 2. the alignment of your story with their story. Crafting your own story requires looking into your past and your future. The company’s story is told through their website, annual reports, office visits, and strategic decisions made as the industry evolved. I hope this series helps you carve out a meaningful career path that is financially fruitful and emotionally engaging. Before you being inter-viewing, you must first inner-view yourself. Inner-viewing is internal. It is communication between you and your authentic self. It requires knowing who you are, what you want, and why. Inter-viewing is external. It is an exchange where two parties are inter-acting to get to know each other better. It requires that both the company and the individual inner-view to explore what they truly want so that they can determine if there is inter-est. Everyone talks about the glass ceiling, but that’s once you’re in the organization. Before you get into the organization, there is a glass mirror that you have to wipe clean in order for a potential employer to truly understand who you are and assess your fit. Interviewing is a lot like dating, we get a little schizophrenic and multiply our identities. There are 4 versions of you in the world; 2 of them live inside you and 2 of them live outside of you. There A. Who you truly are and want to be, B. Who you think you have to be, C. Who they perceive you to be, and D. Who they want you to be. The ultimate goal of an interview is to align all 4 identifies into one. Considering that we spend over 50% of our waking hours in our careers, it is important to feel free to be yourself at work. You shouldn’t have to leave half of yourself in the parking lot and drag the other half of your into the office. When the company you work with/for and the role you work in is aligned with who you are, you will be fulfilled beyond measure. View more presentations from Jullien Gordon.